The first objective of this workshop is to bring together people working in learning analytics generally, open learner models, and learning dashboards, to raise awareness of projects and approaches across research areas, that are relevant to learning analytics for learners. The second objective of this workshop will be to organise a state of the art review on learning analytics for learners for the Journal of Learning Analytics, to be co-authored with key participants at the workshop. This will aim to cover the themes in the first objective, but may be adapted to incorporate expertise and interests of workshop participants. 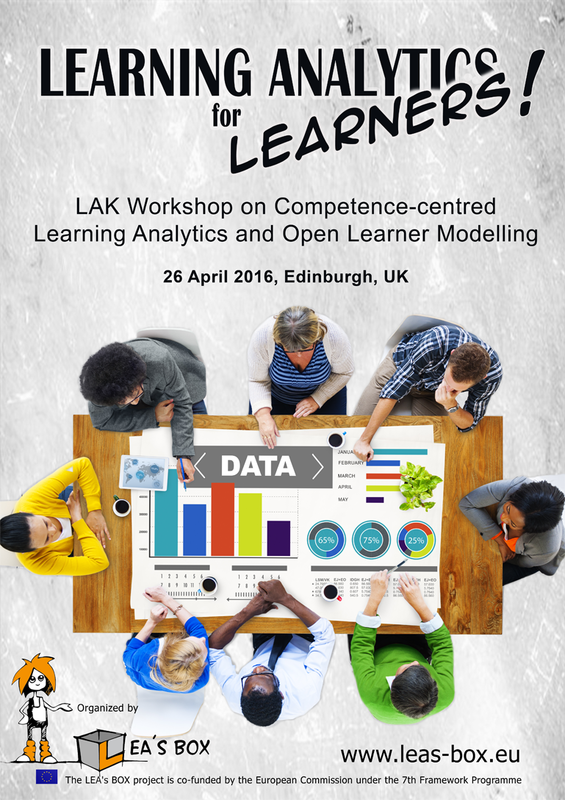 Finally, we aim to continue supporting research on learning analytics for learners in future workshops, and would like to gather suggestions for key topics for the next LAL proposal. This will allow us to foster and stimulate ideas in areas of interest to participants that may not yet be mature enough for inclusion in the review article or workshop proceedings. With the arrival of ‘big data’ in education, the potential was recognised for learning analytics to track students’ learning, to reveal patterns in their learning, or to identify at-risk students, in addition to guiding reform and supporting educators in improving teaching and learning processes . Learning Analytics dashboards have been used at all levels, including institutional, regional and national level . In classroom use, while learning visualisations are often based on counts of activity data or interaction patterns, there is increasing recognition that learning analytics relate to learning, and should therefore provide pedagogically useful information . While increasing numbers of technology-enhanced learning applications are embracing the potential of learning analytics at the classroom level, often these are aimed at teachers. However, learners can also benefit from learning analytics data (e.g.,). Open learner models have long been showing learners information about their learning, often with the aim of encouraging metacognitive behaviours such as reflection, planning, self-assessment and self-directed learning . Benefits of showing learning data to learners for such purposes are now also being investigated in learning analytics (e.g. ,). Nevertheless, despite a few exceptions, there is limited reference to both open learner models and learning analytics in the same publications. One of the aims of this workshop, therefore, is to raise awareness of the overlap, as well as differences, in approaches to, and purposes of visualising learning data in these two fields. In particular, we will bring our substantial expertise in open learner model research, together with our more recent experience in learning analytics for learners, to help facilitate discussion and exchange of experiences amongst participants. We would like to bring our understanding of work related to learning analytics for learners to the learning analytics community, to learn from others’ work on learning analytics for learners, and together build a vision for learning analytics to directly support and facilitate the learning process for learners. 1. Siemens, G. & Long P. 2011. Penetrating the Fog: Analytics in Learning and Education. EDUCAUSE Review 46 (5), 30-38. 2. West, D. 2012. Big Data for Education: Data Mining, Data Analytics, and Web Dashboards. Governance Studies at Brookings. 1-10. 3. Gaševic, D., Dawson, S., & Siemens, G. (2015). Let’s Not Forget: Learning Analytics are about Learning. Techtrends, 59(1), 64-71. 4. Ferguson, R. and Buckingham Shum, S. (2012). Social Learning Analytics: Five Approaches. LAK 2012. 23–33. 5. Vozniuk, A., Govaerts, S., & Gillet, D. 2013. Towards Portable Learning Analytics Dashboards. ICALT 2013, IEEE, 412-416. 6. Bull, S. & Kay, J. 2013. Open Learner Models as Drivers for Metacognitive Processes. In R. Azevedo & V. Aleven (eds), International Handbook of Metacognition and Learning Technologies, Springer New York, 349-365. 7. Dawson, S., Macfadyen, L., Risko E., Foulsham, T. & Kingstone, A. 2012. Using Technology to Encourage Self-Directed Learning: The Collaborative Lecture Annotation System (CLAS). ASCILITE 2012. 8. Durall, E. & Gros, B. 2014. Learning Analytics as a Meta-cognitive Tool. Proceedings of CSEDU 2014, 380-384.